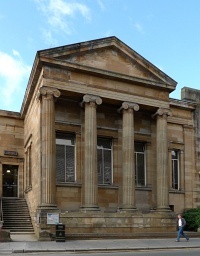 Opened in 1871, Paisley Free Library and Museum was designed by John Honeyman in an austere Greek Revival style. The original building has been extended several times. In 1902–4 Honeyman, Keppie & Mackintosh added a large E. wing to provide additional accommodation for the Library. Authorship: According to W. S. Moyes, who worked in Honeyman, Keppie & Mackintosh's office at this time, Paisley Library (i.e. the 1902–4 extension) was designed by John Keppie. The exterior of the extension faithfully reproduces the details of Honeyman's original building. 1: Scotsman, 2 December 1904, p. 7.